Remember the video of Kurt Cobain singing Bon Jovi's hits, and shrieking "yeah, boyeee!" in "Bring the Noize?" The compilation that hung the game with its own rope for its treatment of Cobain is gone from YouTube, on Activision's demand. Sure, videos get taken down all the time. But search for "Guitar Hero" on YouTube and you get more than 300,000 results. While not all are video directly from the game, it's undeniable that there are many out there showing gameplay, except in a positive light. Most recently there's a guy hundred-percenting eruption in Guitar Hero: Van Halen and using the video to pimp Gamer Grub. Maybe not as embarrassing as the Cobain foofaraw, but I'm sure some lawyer-mans could reason that it's an unauthorized endorsement. Yeah, my last account was permanently disabled due to (I think) Activision. 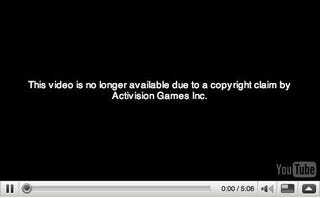 Right before my account was shut down, the Kurt Cobain vid was removed due to copyright claim by Activision Games Inc. I will be continuing with this account so whatever f—k it all. The three videos on his new account are all of Rock Band.